I can’t afford another salary right now. There isn’t enough for another person to do. I really need to do this myself to make sure it’s done right. All of those sound like reasonable justifications for not hiring, but they are really just excuses. Hiring is intimidating, time consuming and hard to do well so you will avoid it as long as you can. At the same time, it is 1 of the most critical factors in your success. To be successful, you need to be able to make the decision on who to hire and when. A very good rule of thumb for who you need at your company in the early days is that every essential function at your company should have at least 1 person whose entire focus and responsibility is for that 1 thing. Every essential function at your company should have at least 1 person whose entire focus and responsibility is for that 1 thing. While the term “essential function” might seem vague, it covers anything that your company MUST do well to succeed. For example, if you are counting on your launch to have a big impact, there should be someone on your team who is solely focused on the launch. If you are scaling up a complex software platform, someone should be solely focused on scaling. If you are raising funding, someone will be spending all of their time on fundraising. The person assigned to each task might be the CEO, a co-founder or an employee but it needs to be someone. Why is it so important to have someone dedicated to that function? Can’t you just split the work among the team you have? Sure, but then you are splitting focus and accountability. If you have 2 top priorities you will only spend half of your time on each and hence do each half as well as you could. Having a sole priority means that someone will do a great job and be held accountable for performance with the rest of the team. If something is essential to your company’s success you cannot afford to have someone do less than their best. Does it mean everyone only does 1 thing? No, but every essential function needs a dedicated person. If you have as many people as essential functions then, yes, everyone has only 1 thing to focus on. Perhaps that means you should hire some more people. The list of essential functions is entirely up to you and very dependent on your business. However, it should already be reflected in the top priorities for your business that you review with your team regularly and are baked into everything that you do. If you have a top priority that does not have a dedicated person next to it, then it’s time to start hiring. Even if you have made the decision that you need to hire to fill an essential function, you can still fall into the trap of putting it off. You will be busy in the chaos of building your business and with all of the short term urgent issues the long term benefits of hiring seem easy to put off. And that assumes they don’t take any time off between jobs. For sales people you need to assume another 2 months after training before they are productive because you can’t close deals the minute you start selling. That means that you need almost 6 months lead time before sales people will be productive after you decide you hire 1. To put it in perspective, let’s say you are an enterprise sales driven company (revenue is derived from sales people) and you have a revenue forecast that has you growing by 10x in 9 months. Your hiring plan should reflect that you need to grow your sales team by an equivalent amount and account for lead time before they become productive. In order to meet your aggressive 9 month revenue growth plan, you need to start recruiting aggressively in the next 3 months with the goal of hiring 1 new hire in month 3, 2 in month 4 and 4 in month 5. This assumes equivalent production per salesperson which is a safe assumption and plenty of lead time for both recruiting and on-boarding. If you had taken a conservative approach to hiring and only hired 1 sales person per month, you would have failed before you even started. 9 months later you would wonder why you are falling short of your plan and why it’s taking so long to ramp up your team. This example uses sales people, but the same principle applies to engineers, marketers and every other part of your business. If you don’t think you can hire enough people to meet your plan based on the lead time to productivity, perhaps you need to revisit your goals. If you MUST reach your goals, then you better hire ahead of the goal. Even after deciding who to hire and giving yourself enough lead time, you will probably fall back on the final excuse: I can’t afford another person right now. That might be true, very few new businesses can afford the salaries of their founding team and definitely can’t afford new hires. Regardless, that should not stop you. As an early stage company you can offer prospective employees things they can’t get elsewhere: large amounts of equity and the chance to be in on the ground floor of a huge company. Many people work for startup companies for fractions of a percent ownership later in their lifetime when there is less risk. Many of those same people would jump at the chance to own a few percentage points of a new company, even if they need to work for much less salary or even minimum wage. Don’t worry about giving these people a generous equity package because they will become the leaders as your company grows, hiring and building teams of their own. You want them to feel as much ownership in your company as possible. Also remember that as you become more successful, you will start paying better salaries. Someone who joins you early for a lot of equity and a low salary will eventually get a better salary, and still own their equity. Many people would take that trade and live off their savings for 6-12 months, especially the kinds of people you would want to hire. 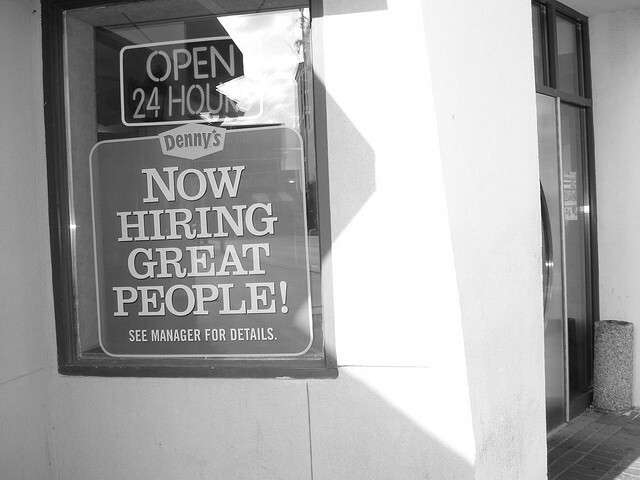 In the end, hiring is hard and it’s easy to put off. However, the satisfaction you get from hiring great people to fill important needs for your business and see them contribute to its success is 1 of the best rewards.